You are here: Home / Hormones and Weight Resistance / Is Your Hunger Disguised or is it Real? For most of us, the first irritating feelings of discomfort caused from hunger are easy to ignore, they can be put aside for a short while. But, eventually those feelings become more intense as the body tries to grab out attention. The brain sends signals for the release of acid in the stomach in preparation for the intake and digestion of food. This is what we feel as emptiness, or the uncomfortable feeling in our stomach. Internal biological processes tell you whether you are currently hungry or full. Your appetite control system is a maze of complex chemical interchanges and interactions between your brain, nervous system, and metabolic hormones. These work in concert to tell you whether or not you need food. These delicate hunger control systems identify when energy and fuel is needed but they can become out of balance and go haywire causing you to receive the wrong signals and eat when you are not really hungry and continue eating when you are full. The danger in ignoring real hunger signals is that we get so hungry that we easily devour more than a couple of meals worth of food in one sitting. Better to have listened to your body’s signals and keep things at a manageable level. Eating shortly after we receive our first hunger signal allows us to better control our intake of food and better control and pay attention to what we are eating. There are two basic types of hunger you need to get acquainted with. Normal physical hunger occurs when the stomach has been empty for several hours. It starts slowly and intensifies the longer you wait to eat. This kind of hunger is noticeable after you’ve exercised or performed lots of manual physical work. Your body is signaling that it needs nutrients and energy. Hormone driven hunger comes on suddenly, seemingly out of nowhere and most times is not aligned with meal time. It can be very persistent, causing your desire to eat to sky rocket overwhelming even the most determined dieter. 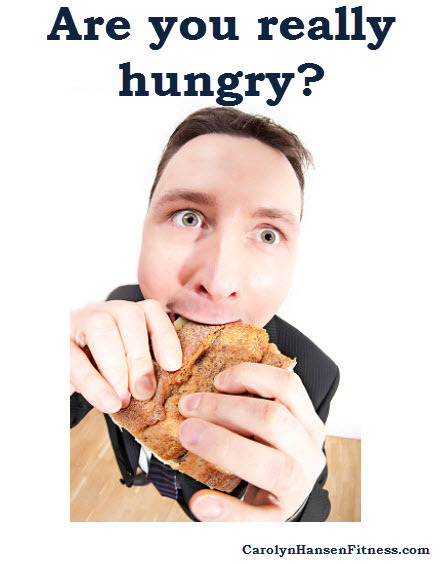 Mood swings, stress, anxiety and low energy are all results of hormone driven hunger. Many times people refer to this type of eating as “emotional eating” because of this, however science is proving that it has nothing to do with emotions but is rally the result of out of balance hormones in the body. Whenever you feel yourself attacking food even though you don’t have the accompanying hunger pangs then you most likely driven by hormonal hunger. The best way to avoid natural physical hunger is to eat before you become hungry or soon after receiving the first hunger signals. To avoid hormone driven hunger you need to eat often and supply your body with the nutrients it needs to keep the hormones in balance. You need to know what and when to eat in order for this to be effective. Understanding hunger and how it operates is just part of the weight loss puzzle. If you’ve been trying to lose weight and continue to struggle then “Stop Weight Loss Resistance” can help. Ask yourself if you can look in the mirror and honestly say that you’re body is in peak shape, performing at peak performance. If not its time to be proactive…its time to make a change because nobody can do this for you.